Summer Book Club: Paving Paradise Florida’s Vanishing Wetlands and Failure of no Net Loss. 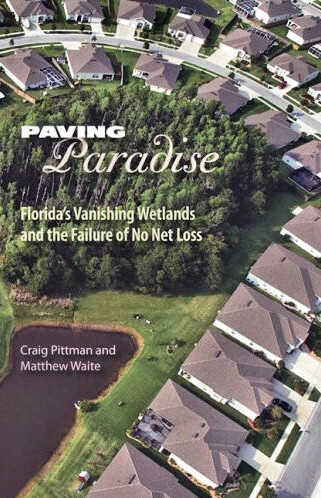 Summer Book Club: Paving Paradise Florida’s Vanishing Wetlands and Failure of no Net Loss by Craig Pittman and Matthew Waite. What is no Net Loss? Is it even on our radar? So while all these political people are running around having debates etc. I’m concerned with the BS that goes on. How people say one thing and do another? I’ll bet not one of these people running understand this including the two from Florida because it’s so far off their radar. I think we need to start making a reading list for anyone running for office. This would be on the top of my list. You guys know I hate to read books my self. Books are meant to be talked about, discussed, educate people. This is what I’m reading this summer. Bulldozed and buried wetlands underlie the foundations of thousands of mines, highways, golf courses and shopping malls all over our state, despite clear federal and state policy calling for no net loss of wetlands. It was President George H.W. Bush who first articulated this policy in 1988. “We are going to stand wetlands protection on its ear,” declared the marsh- and duck-loving president. Florida has lost over 84,000 acres of wetlands since 1990, this despite “no net loss” mandates. For 4 years Journalists Craig Pittman and Matthew Waite investigated how Federal, state and local legislators failed to protect Florida’s wetlands from developers and their developments. In this book Pittman and Waite explain how “wetland protection” often just gives the illusion of protecting the environment while it allows Florida’s native habitat to be paved over. Pittman and Waite are both reporters at the St. Petersburg Times and have twice earned the top investigative reporting prize in the nation from the Society of Environmental Journalists as well as the Waldo Proffit Award for Excellence in Environmental Journalism in Florida. Florida possesses more wetlands than any other state except Alaska, yet since 1990 more than 84,000 acres have been lost to development despite presidential pledges to protect them. How and why the state’s wetlands are continuing to disappear is the subject of “Paving Paradise”. Journalists Craig Pittman and Matthew Waite spent nearly four years investigating the political expedience, corruption, and negligence on the part of federal and state agencies that led to a failure to enforce regulations on developers. They traveled throughout the state, interviewed hundreds of people, dug through thousands of documents, and analyzed satellite imagery to identify former wetlands that were now houses, stores, and parking lots. Exposing the unseen environmental consequences of rampant sprawl, Pittman and Waite explain how wetland protection creates the illusion of environmental protection while doing little to stem the tide of destruction. What is happening to Florida’s ‘protected’ wetlands? Here is Craig’s Twitter which is very funny and informative. You can see for yourself. Here is the book’s website. This is one person that Elliot or the RC could invite invite to talk to us. n an award-winning newspaper series, two investigative reporters from the St. Petersburg Times chronicled how federal rules meant to protect the nation’s wetlands were more illusion than law. Now, that series has been expanded into a book, delving into how we got to this point, starting with land speculators making waterfront property out of sand dredged from the bottom of the ocean. Now, read how the nation’s wetlands protections were formed in clashes between developers, bureaucrats, judges, activists and con artists over Florida swamps. and don’t tell me the ending! This entry was posted in clean water, corporations, environmental, everglades, florida, florida politics and tagged craig pittman, florida, Matthew Waite, nathanial reed, no net loss, paving paradise, wetlands. ← So long john and thanks for all the fish! Plus hysterical republican debate on Fox.